The virtual menu was designed for ordering and sorting the list of the organizations products and services. Customized menu and folders are used for arranging the products according to the organization requirements, and for creating the products catalog. 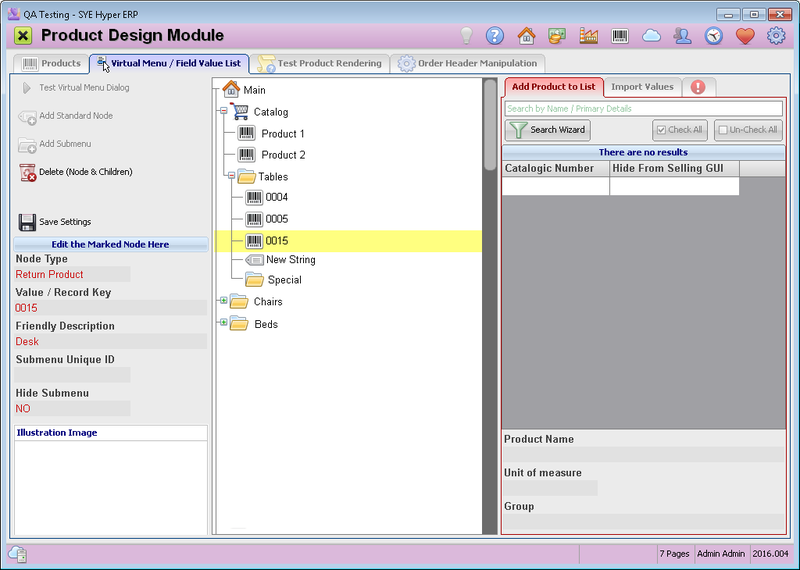 This button displays a catalog preview for the selected folder in the products tree. This button is available only when pointing a products folder. This button is used for adding more options for selected product. This option is usually in use for adding definitions or customized product options to the product. This button is available only when pointing a products folder. Create a new sub menu (products folder) in the selected folder. This button is available only when pointing a products folder. Delete the selected product / node (and its children). The products tree at the center of this screen, displays all of the organization products and services, sorted in folders and sub folders. The tree is created and built from each of the two primary default folders: Main / Catalog. These folders can not be deleted or renamed. The primary folder of the tree. Catalog - This folder contains the sub folders and the products that will be displayed in the products catalog. Menu / Sub Menu - these menus are used for the ordering and sorting of the products. The description fields at the bottom, describe any selected folder or product. Point a folder / product / node, to display its details. Some of the folders and nodes details can be modified. Use the right click menu, to move the nodes and folders up/down, to change the order or sort the products. Folder and its products can be hidden, by choosing "YES" in the "Hide Submenu" field. Fill in the search field with the product name / catalog number, and press Enter. Alternatively, use the Search Wizard button to use customized filters. The table will display the search results. Select the required folder in the products tree, to add the products to. Use the check boxes in the "Catalogic Number" field of the search results, to choose the required products for the selected folder.